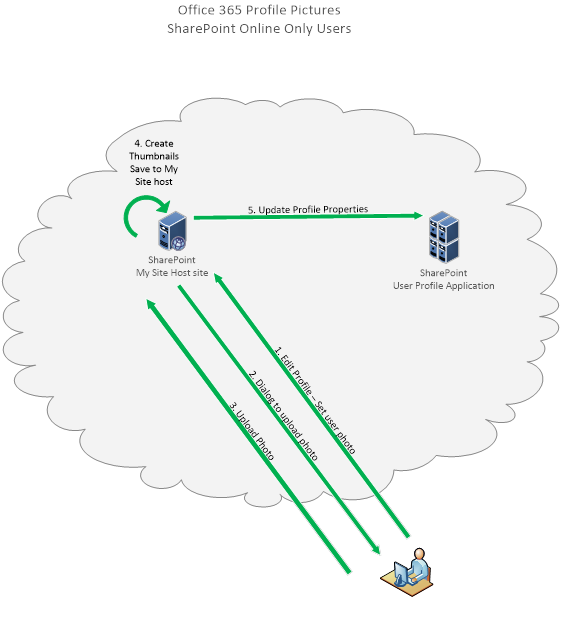 This article describes the SharePoint Online user profile picture synchronization process in Office 365. This includes information about where you should see the profile pictures and where the profile pictures are stored in SharePoint Online. NOTE: The examples in the Procedure section show only two ways for the photo sync to occur. There are multiple ways to start the photo sync. The following example shows the synchronization process that occurs when a user who has an Exchange Online mailbox browses to a page in SharePoint Online. The user browses to the SharePoint Online home page or their OneDrive for Business site. During a page load operation in SharePoint Online, a request is made for the photo. This generates a call to Exchange Online for the user's profile picture. NOTE: This is not the only way to generate a call to Exchange Online for the user's profile picture. In fact, a photo sync is attempted every time that the user requests their own photo in SharePoint Online. If the user has an Exchange Online mailbox, and the mailbox contains a profile picture for the user, SharePoint Online will request the picture from Exchange Online. SharePoint Online creates a small, medium, and large thumbnail photo from the picture that was returned from Exchange Online. The photos are saved in a folder in the User Photos Library for the My Site Host site collection. The name of the folder will vary, depending on what the My Site Host root web locale is set to at the time of photo upload or synchronization. NOTE: If the My Site Host root web locale is set to English, the name of the folder will be Profile Pictures. The Picture Timestamp, Picture Placeholder State, and Picture Exchange Sync State profile properties for the user are set or updated to reflect the profile picture synchronization state. The following example shows the synchronization process that occurs when a user who doesn't have an Exchange Online mailbox browses to a page in SharePoint Online. Browse to the My Profile page by clicking the photo icon in the upper-right corner of the Office 365 suite navigation bar and then clicking the My Profile link. For more information, see View and update your profile in Office Delve. NOTE: When a user doesn't have an Exchange Online license, the Picture property will have an Upload picture button. The Picture Exchange Sync State is set to 0. Click the Basic Information tab, and then click Upload picture. The Choose a picture dialog box is displayed. Upload a picture to SharePoint Online from the Choose a picture dialog box. SharePoint Online creates a small, medium, and large thumbnail photo from the uploaded picture. The photos are saved in a folder in the User Photos Library for the My Site Host site collection. The name of the folder will vary, depending on what the My Site Host root web locale is set to at the time of photo upload or synchronization. The Delve Profile page consists of three sections: the Office 365 suite navigation bar, the Delve Profile pane, and the left-side navigation pane. The user’s profile picture is displayed in all the sections that make up the Delve Profile page. The images are tagged so that they will be cached by the browser. When you change your profile picture, you may have to clear the browser image cache. For more information about the Delve Profile Page, see Connect and collaborate in Office Delve. Note Users who are licensed for only SharePoint Online won't see their user profile picture displayed in only the suite navigation bar in SharePoint Online. They will see a silhouette placeholder picture, as shown here, in the Office 365 suite navigation bar in other applications. User profile pictures are stored in the My Site Host site collection. The My Site Host site collection is created from the SPSMSITEHOST#0 template. When the SharePoint Online tenant is provisioned, a My Site Host site collection is created. The profile pictures are stored in a document library that's named "User Photos." The pictures are stored in a folder inside the User Photo document library by having a .jpg file name extension. The name of the folder will vary, depending on what the My Site Host root web locale is set to at the time of photo upload or synchronization. The name of the file is the normalized user name of the user account, appended by using one of the name fragments. For example: UserNameLThumb.jpg, UserNameMThumb.jpg and UserNameSThumb.jpg. Guest user profile pictures aren't synced to SharePoint Online. By default, SharePoint Online provides three placeholder pictures (SThumb.jpg, MThumb.jpg, and LThumb.jpg) for the user. Each user profile has a property that is named Picture (PictureUrl) and that points to the medium file (MThumb.jpg) that's located in the My Site Host site collection. By default, the Picture property in the user profile application is editable. The property setting has to be editable for picture synchronization and for a user profile picture upload to be successful. The picture is synced with Exchange Online only one time every 24 hours. The My Site Host site collection must have available quota in order to store new pictures. The Exchange administrator can upload a photo to Exchange Online using the Set-UserPhoto PowerShell cmdlet. For more information, see Set-UserPhoto. A user uploads a picture in Outlook on the web. A user browses to the Delve Profile Page, clicks Edit Profile, clicks Change your photo, and then uploads a picture to Outlook on the web. NOTE: The Picture property controls the time during which a user has an Exchange Online Mailbox. Picture Exchange Sync State is set to 1. A user clicks change under their profile picture in the suite navigation bar at the top of the page. A user browses to the Office 365 Portal, clicks Personal info, and then clicks Change Photo under their profile picture. For example, see https://portal.office.com/account/#personalinfo. 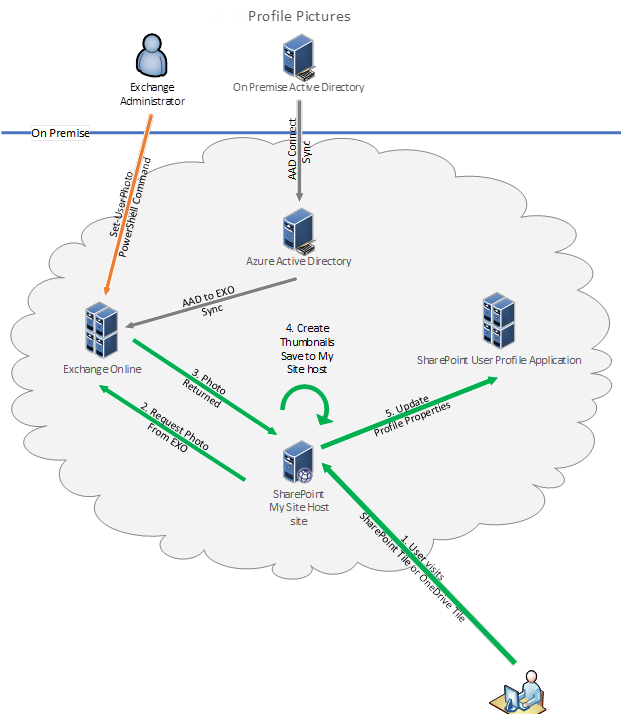 The ThumbnailPhoto Active Directory attribute is synced to Azure Active Directory (Azure AD) with Azure AD Connect. The thumbnails are then synced to Exchange Online. NOTE: This method produces low-resolution profile pictures. The ThumbnailPhoto Active Directory attribute isn't synced to SharePoint from Azure Active Directory.